View some of our recent work and check out hot deals. Here is a one of kind Alumawood patio cover. The house was built on a hill and make the cover look like it was under ground from the back yard. Alumawood in 2016 is the best way to upgrade your home. 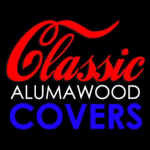 Classic Alumawood Covers would like to be your contractor for the job. Call us for a free estimate and find out what is possible with Alumawood. No more strenuous maintenance on you patio cover. We will help you create an Alumawood design that will “WOW” you. You don’t have to break the bank to get the Alumawood patio cover of you dreams. Our estimator will go over all the options to make your patio just the way you want to fit you life style. Here are some of the projects we completed last year in 2015. 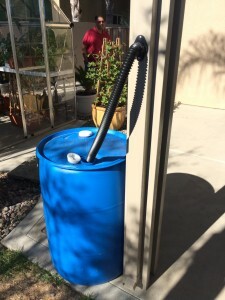 Check out this Rain Barrels for Alumawood patio covers. 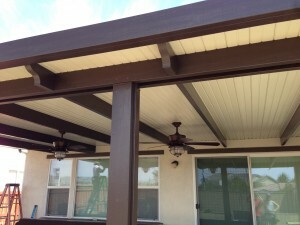 They can be used on the rain gutter system that comes with the solid Alumawood patio covers. Great way to save water during the drought. Rain Barrels on Alumawood patio cover. Here is a link to the kit from Home Depot. Alumawood lighting can be done in so many different ways. All of the material is hollow and help hide most of the wire and pipe needed to run the electrical. Alumawood hides the wiring very will and leaves you with a clean finished product that anyone would admire. Classic Alumawood Covers collected some night pictures so you can see for your self an Alumawood patio cover at night. Added lighting and electrical make an Alumawood cover so much more functional. Get the most out of you patio cover with electrical and lighting. 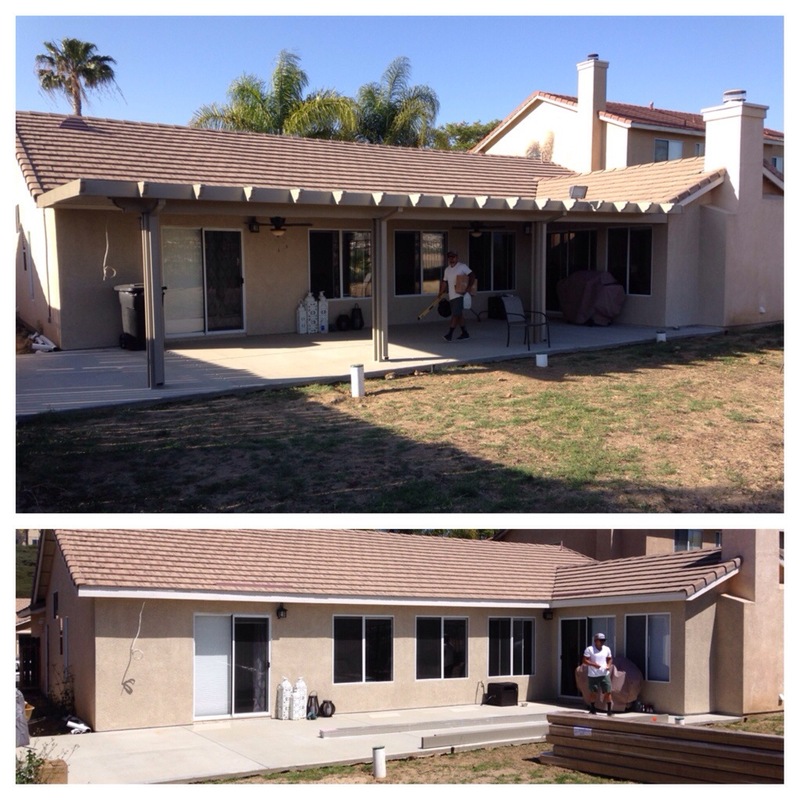 Ask us about it on you free estimate, you can request an estimate online or by calling 951-674-8533. January has started of great with low gas prices and more business this year then last. 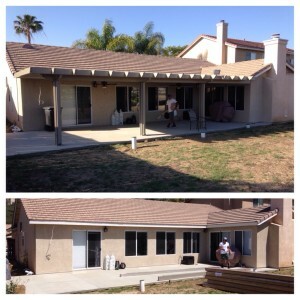 We will be ready to give an estimate to anyone looking for an Alumawood patio cover. Here are just a few jobs we have done this year and we are looking forward to the rest of 2015. Solid Aluminum roof with all the electrical. 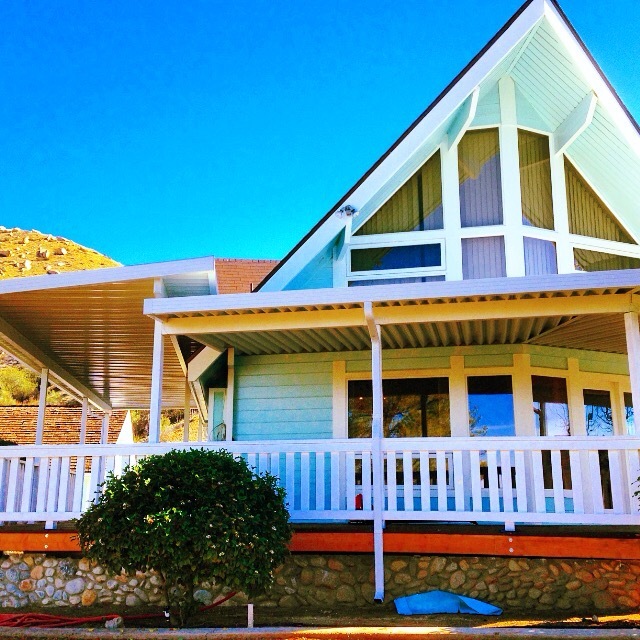 Give David a call at 951-674-8533 and he can give you a rough estimate over the phone or come visit you at you house. What do you want most out of you Alumawood patio cover? 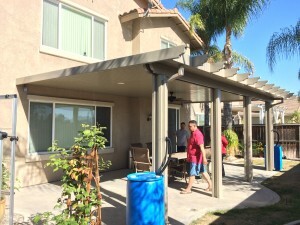 What make an Alumawood patio cover a quality product? 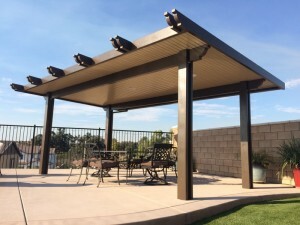 Two major factors in having construction of an aluminum patio cover are the quality of the product and the quality of the company you choose to build your project. Let start with the integrity of the products. 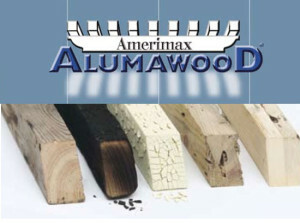 Our product is Alumawood by Amerimax Building Products. There are alot of other brands out there but there is only one Alumawood. Amerimax has been around for over 50 years helping homeowners get more value, more space, and enjoyment from their homes. The paint job is second to none with the Alumawood Aluma-Sheild paint system with TEFLON surface protector. You can also consider the Alumawood Transferable Warranty to know you have a company that will back up their products. Classic Alumawood Covers has over 30 years combined experience in the business of Alumawood products. We have many other ways to review our business on yelp, facebook, and instagram. We also have many testimonials from previous customers. Our main ideal is that you should love you neighbor as you love yourself. 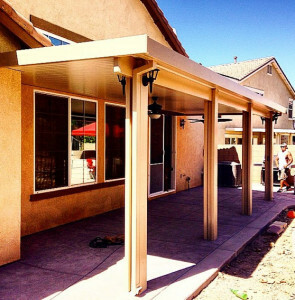 We appreciate you considering us to build your Alumawood patio cover. You can reach us the following ways. One of a kind Wpan aluminum awning. Although this patio has a lot of custom cuts, this product is very affordable for the average patio cover. Each aluminum awing is different but usually when they are larger in square footage. Give us a call to get a price on a aluminum awing today. Just so you know you.. When pulling a permit for your patio cover you can always pull an Owner Builder permit and build your Alumawood patio cover yourself. Even if you just want to save to money pulling the permit, buying the material and then hiring a contractor to build the patio. This way you can save a little money and keep track of the expenses. It is a little bit more busy work but if you have the time then it may be worth it in the end. I will be expanding on the subject soon. Any question just email us or call.